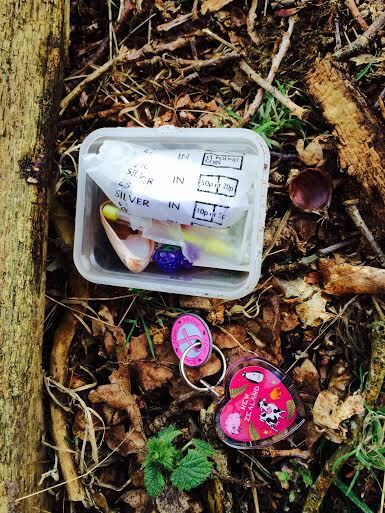 We started Geocaching late last August and were fairly quickly hooked; enjoying finding a few caches here and there. 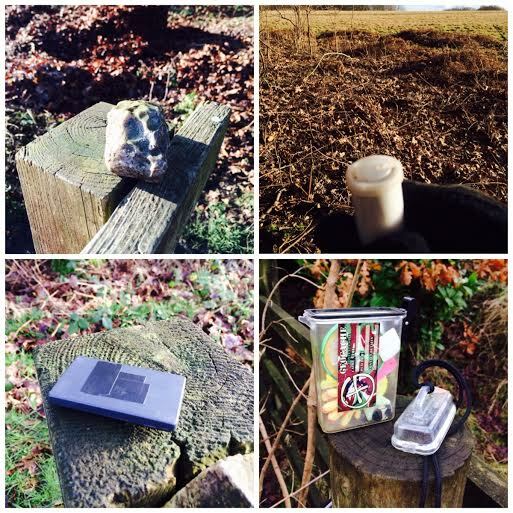 On 31st December I logged a local find and was extremely pleased to receive a brief message from the cache owner SandhurstGeocaching along with the address of their blog. We thoroughly enjoyed reading about their travels and their challenges so Cockrobbinn and I thought what a fantastic way to diarize our own adventures, little as they are, and to give friends and family the choice of whether they want to read them or not. I very tentatively logged into wordpress.com and had a look around. Over Christmas, Cockrobbinn and I had an interesting conversation with my son and his wife about when computers had started being a part of our lives. I can still remember sitting for hours at the keyboard typing in data and seeing it turn into the most basic game of tennis or space invader and we thought it magical. Thank goodness I learned to touch type all those years ago! I seem to remember we were one of the first of our group to buy a computer and I also remember telling our sons that we couldn’t go online as it would be too expensive – I believe it was so much per minute on dial-up. I am harking back here probably to very early eighties but computers are so much part of our lives now that the following picture really rings true sometimes! For my own children (grown up as they may be!) 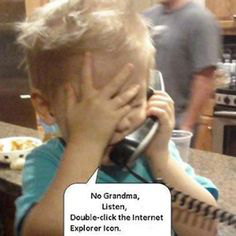 and my grandchildren, computers are a fundamental part of life but for many of my peer group, they are not. Even today, my brother refuses to touch one; my husband openly admits to being a neanderthal where computers are concerned and was the thorn in his IT Department’s side for many years (he can make computers do things that they really cannot do and he is forbidden to touch any of mine!) and quite a few of our friends don’t have a computer, and some others, at best, can send and receive emails. The reason I am stating all of this is that with the dawning of the age of computers has come hobbies such as Geocaching, and the ability to converse with people all over the globe who have similar hobbies. Reading for the first time some of the blogs on Geocaching and seeing that some people routinely get thirty, forty, even a hundred caches in one day made me think we were just dipping our toes in the huge ocean of life, but then realizing that finding one cache is just as rewarding and exciting. However, last weekend we set off at lunchtime with the intention of finding ‘just a few’ caches on the W.W.S.W. 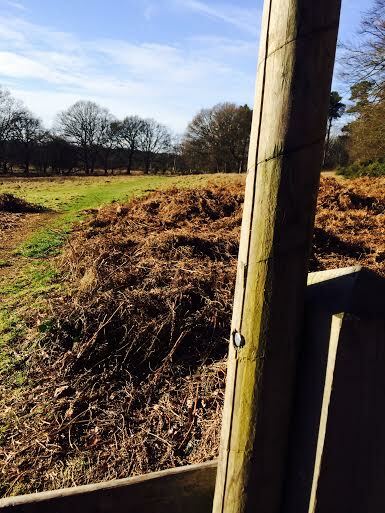 series set by Westie Walker; 20+ caches around Minley Manor, much of it on army training grounds not far from where we live. We had our grand-daughter staying over on the Friday night and as she was being picked-up about 11.30am, we were ‘booted and suited’ and ready to leave as soon as she had gone. 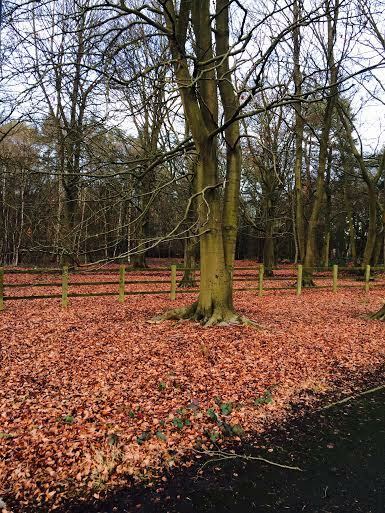 We started walking just before noon and at 4pm we were tired, hungry and thirsty but over the moon as we had found a staggering 22 caches which included two outside of the series. At last, we felt like REAL Geocachers and we celebrated, muddy boots, wet trouser bottoms etc by having a really good meal at the Crown and Cushion pub which was very near to the start and finish of our circuit (we started at #11). We approached the circuit from the corner of the car park of the Crown and Cushion and although it was cold, it was a beautiful sunny afternoon. Not sure why, but we were working our way backwards and from #11 we forged ahead (or backwards) to #10 where we found a Breast Cancer Travel Tag GeoCoin. I definitely had to retrieve this GeoCoin as it was attached to a New Zealand keyring and it seemed appropriate as my daughter-in-law is a Kiwi, making my grand-daughter and grandson half-Kiwi. I have since dropped this off at a cache in Chobham. Not very far in miles but I didn’t want to keep it too long. This GeoCoin originated in Sweden and has, to date, travelled 25992.1 miles !!!! I find this amazing and that I have managed to add just a few miles to its journey. Perfect day for a stroll! 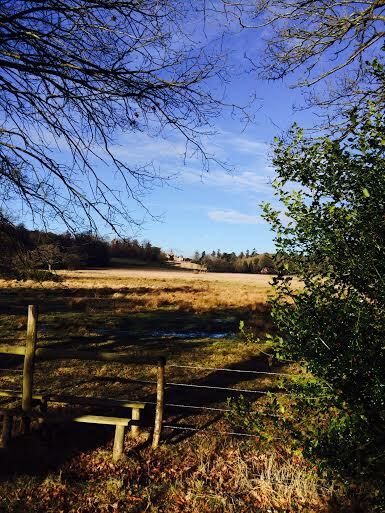 and soon came across views of Minley Manor in the distance. Minley Manor is a Grade 2 listed country manor house, built in the French style by Henry Clutton in the 1860s with further additions in the 1880s. The Manor is situated 2 miles north of junction 4A of the M3 between Farnborough and Yateley in Hampshire, England and is situated in 38 hectares of grounds. We were going great guns and I was marching on when suddenly I realized I was leaving Cockrobbinn behind. I have been known to lose him completely and knowing his dreadful sense of direction – even with a Garmin – I waited for him to catch up. He can just be seen in the distance…. Cockrobbinn and I have been together now for fifteen years. 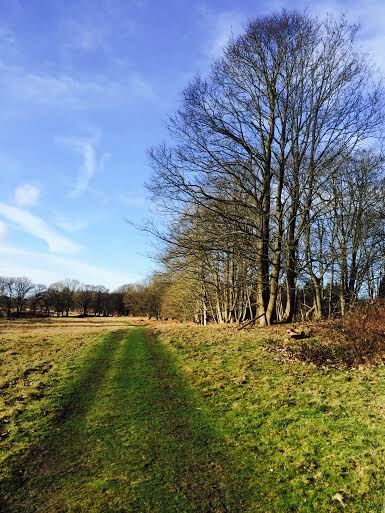 When we first met, his idea of a country walk was along a tarmac path in some city park. I soon showed him the delights of tramping along footpaths, beating through the undergrowth, and crossing numerous streams and rivers whilst walking with my Golden Retrievers who were never happier than when soaking wet or covered in mud. He must have enjoyed it as we are still together. To be fair, Cockrobbinn comes in very handy when caches are in difficult places. 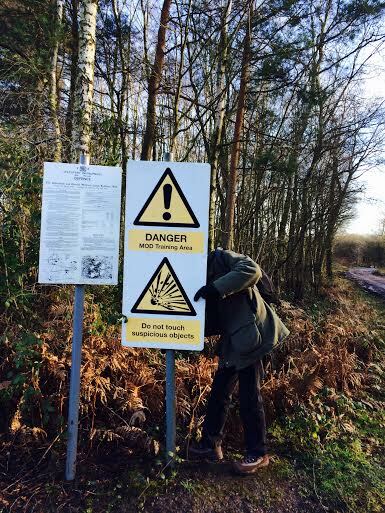 He gamely dives through brambles, fords streams and searches in rotting logs and behind signs. When we were first caching on the Isle of Wight, Cockrobbinn managed to slip off a tiny plank bridge; slither down a brambly slope and end up sitting on his bum in a little stream whilst I nearly wet myself laughing. His response when he saw that I was taking a photo of him, cannot be put into print! Needless to say, it has not put him off Geocaching thankfully. It was just after finding a cache near the above sign that I decided to head into the bushes; call of nature, or call it what you will. Being very careful of the brambles, icy leaves and stalks, wind chill factor on my bare bottom, and making sure the Army were not on manoevures in the next field, I managed very well. 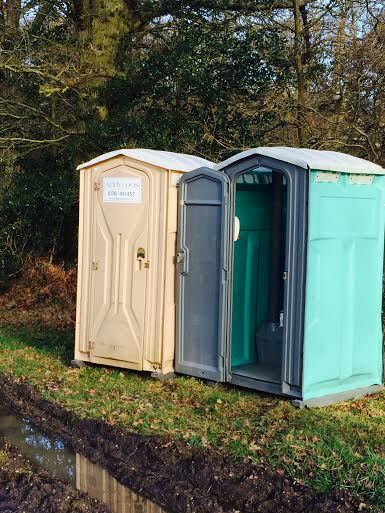 Imagine our surprise when only a few minutes later, on the way to the next cache, mindful that we were out in the wilds of Minley Forest, seemingly miles from anywhere, we come across extremely clean and tidy port-a-loos standing on the side of the track. Unbelievable. If only I had waited! By now both Cockrobbinn and I were getting weary and foot sore. Checking the map it was obvious that it was probably quicker to continue on the circuit rather than try and head back across country. We picked up more caches on the way and eventually came to a style but saw that the route took us through a large field full of huge cows. Now, I am not normally nervous around cattle but these looked enormous and I was surprised to see that quite a few of them had calves (in January?). Telling Cockrobbinn to walk slowly but surely across the field ignoring the cows (and calves) and that they would move out of our way as we approach I felt very brave. But the nearer we got to the herd, the bigger they looked and the blighters were not going to move. They straddled the path through most of the field and we had to step around them, avoiding the cowpats, keenly aware that they were watching every step we took. I have never been so pleased to reach the next style as I was that time. I think it was halfway across the field Cockrobbinn decided to remember the fact that two walkers had recently been trampled to death, in separate circumstances, somewhere in England. We were on the homeward stretch and the route now took us along tiny tracks rather than footpaths across fields. We felt much happier. That is until we found the road blocked by floods! No way were we going back through the field of cows. I would rather have taken off my boots and socks and waded through the icy water (as I know a fellow blogger did) than face those cows again. 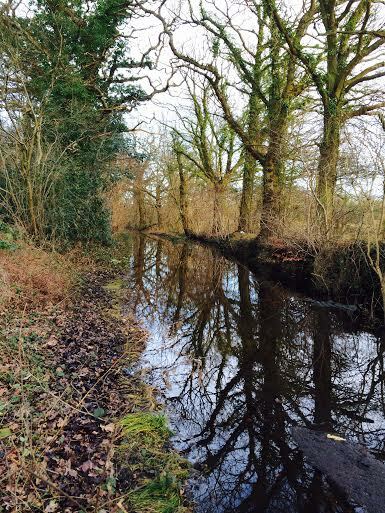 We very carefully managed to find a way through the trees and brambles at the side of the road although at one point we did think that it was impossible but eventually we came to the end of the flood. Another few caches saw us back into civilization and we crossed a main road and finished our journey through beautiful woods with no water in sight. We had found 22 caches in total (no DNFs) and there were so many different kinds of containers that it made it really exciting to go onto the next one. From imitation rocks, magnetic micros to klip-lock boxes and the usual 35mm film containers. Back at the pub we checked online to find that we had missed two of the WWSW series towards the end of our route, but the very next day we returned to snag those as well. A big thank you to Westie Walker for setting these caches and introducing us to some beautiful countryside so very near to where we live. At the end of this walk, we were approaching our 150th find and 22 caches was the most we had ever found in a day. 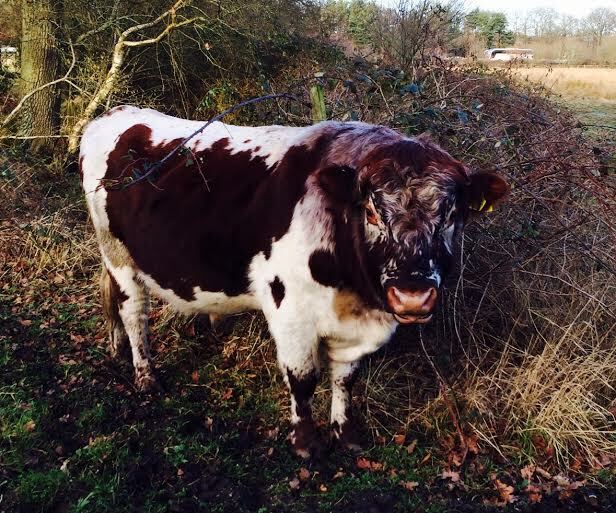 This entry was posted in Caching, Geocaching, GeoCoins, Minley and tagged Geocaching, GeoCoins, Hobbies, Minley Manor. Bookmark the permalink.